We have blocks reserved at the following hotels. 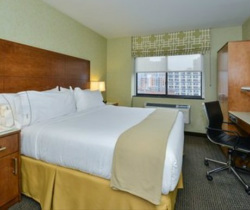 Keep in mind that NYC's average daily room rate for 2013 was $306/night, so enjoy your savings! Please be sure to mention the Fontana-Minkoff wedding when booking. New York, NY 10036. Located 1 block from the wedding/reception/afterparty/brunch and 2 blocks from our Welcome Dinner. All guests may make their reservations by either booking a room online here and using the code, 140828MINK, or by calling the Pre-Arrival Team directly at (646) 449-7700 or (877) 909-6835 and identifying themselves as being with the Fontana-Minkoff Wedding Party. The negotiated room rate is $255/night + tax and the room block will be released on Aug 8, 2014 (though one of our guests reported getting an additional room at $229 plus tax, so it might be worth asking). A mere one block walk from Yotel to wedding and reception at Espace. Two blocks to Times Square. Hard beds, that some yelpers rave about and other bemoan. 235 W. 46th St. (46th St b/w 7th and 8th Aves) New York, NY 10036. Located about a 20 minute walk or a 10 minute cab ride (depending on traffic) from the wedding. 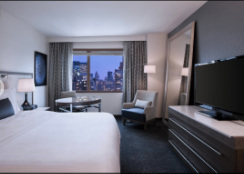 Guests can either book their reservations online or call the hotel at 212-764-5500 and book through the reservations department. The group block is under Fontana-Minkoff and the negotiated room rate is $189/night + tax. The cut-off date for reserving a room is July 29, 2014. New York, NY 10036. About a 10 minute walk from the wedding. Reserve a room online here or call the hotel at 212-582-0692 and mention the Fontana Minkoff Wedding Block. The negotiated room rate of $199/night + tax before the cut-off date of July 28, 2014. The Block Code is FMW. New York, NY 10036. About a 15 minute walk from the wedding and walking distance to over 40 Broadway theaters, in case you want to catch a show or two while you're in town. Guests can either book online through our StarGroups web-link or call 1-888-627-7149 and identify themselves with the Fontana/Minkoff Wedding. The negotiated room rate is $269/night + tax, and the block will be released on July 29, 2014. Parking is located at 252 West 40th Street b/w 7th and 8th Aves. The hotel offers valet parking at a fee of $60.00 + tax per day. Self parking is available at a fee of $29.00 (tax included) per day. (For SUVs, an additional $5 fee applies). The Travel Inn is also located just one block away from the wedding venue. They would not offer us a block or discount, but they may be the right choice for some travelers, especially those driving or with kids who might enjoy some poolside fun. Rooms run about $200 + tax. The hotel also offers an outdoor pool with lifeguard and parking, which is $20/night. For anyone driving, this is equal to about $35-$45/day for a parking garage and that balances the difference between the room charge here and the cost of the Yotel. The Out Hotel is also just one block away from the wedding venue. They are very gay friendly, as the name suggests. They have a page for special deals. When you do a search for a room, the enticingly low price of $120/night may appear. WARNING: That is a per bed price for a shared room. You are literally getting one of four bunks. Now, if you have four people, none of whom wish to share a bed, and you each want your own bunk for $120 in a shared room, this could be ideal. But if you have only two people, not only will you not sleep in the same bed, but the hotel may put two strangers in the other two bunks. It's a fairly elegant hotel, but this is a little social experiment that you may or may not want to engage in. Just thought you should know. Some guests may be fans of the Kimpton line of hotels. Ink48 is located on West 48th Street and 11th ave, a 5-10 minute walk (or $5 taxi) to the venue, located on west 42nd between 11th Ave. and 12th Ave. Room prices range from $250-$350 or more. Some stunning views of the city. No pool. This is probably the most quiet and elegant of the hotel options.